Many people will tell you that the P.F. Chang’s secret menu doesn’t exist. In fact, we have heard those same words from servers. But some of their colleagues have told us otherwise, and we have also had confirmation from many of their regular customers. The truth is that the P.F. Chang’s secret menu does exist. It may not be as substantial as the KFC secret menu. Nor is it as big as casual dining menus like the Nando’s secret menu or the Olive Garden secret menu. But make no mistake about it, it exists, and in this article we’ll cover as much of it as we can. What is on the P.F. 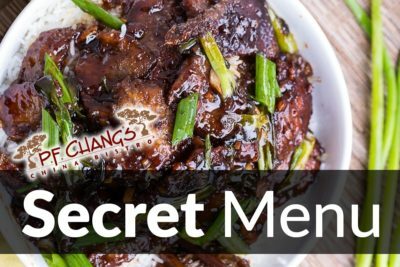 Chang’s Secret Menu? Just because something is no longer on the menu, doesn’t mean you can’t order it. If there was a special on the menu once, then it will still be there. You just need to ask for it. Specials are there to use up a large stockpile of food that the restaurant ordered in to prepare dishes. If they suddenly have a stockpile of beef and not enough orders for their beef dishes, they will add an extra special item to use it all up and to make money from it before it expires. Of course, this is not the case across the chain. Each location has its own specials and these are often short-lived. But even if there is a special in one location but not in yours, you can still order it. According to a source that works at P.F. Chang’s, there are two options when a server is punching an order into the computer. There is an option for standard menu items and special menu items. The specials are transient, which means they are not on the system and therefore need to be separated. So, if you order it, they will put it on this separate section, the chefs will prepare it and you’ll get it. The specials cover all kinds of dishes and there is no end to what you can eat with these options. If it involves foods commonly prepared and cooked at the chain, then you can probably order it as a special dish. There is a mixture of American and Asian desserts on the P.F. Chang’s menu. There are also desserts that combine influences from both of these cuisines. One of the best All-American desserts, and one that you won’t find on the standard menu, is the Apple Tort. This classic sweet treat is a few steps removed from a traditional Apple Pie, the perfect way to finish a light meal. If you’ve gone all-out with a four course meal, then you might want to try some simple Banana Spring Rolls instead. But if you’re looking to finish in style and you’re not keen on the Cobbler, this is the perfect alternative.